A health benefit that benefits YOU. Ready for a healthcare experience that puts patients first? Accresa is revolutionizing the traditional healthcare delivery model by allowing employers to easily implement and manage a direct primary care (DPC) benefit for their employee population. DPC is designed to foster stronger relationships between patients and their physicians. And through the Accresa platform, employees who have access to a DPC benefit through their employer enjoy dedicated, concierge-style primary care from their physician of choice – with full transparency into pricing, services, and providers available. Dedicated access to exceptional care from your physician of choice, with a focus on keeping you well. In other words, healthcare the way it was always meant to be. With Accresa, patients choose doctors for themselves and their family members, and enjoy full flexibility in when and how they receive care. Physicians enjoy the ability to spend more time with their patients, building sound relationships with those they serve to optimize health and wellness outcomes. Accresa is removing barriers between those providing the care and the patients who need it – because healthcare is personal, and we believe it's about time the system reflected it. part of the Accresa network? 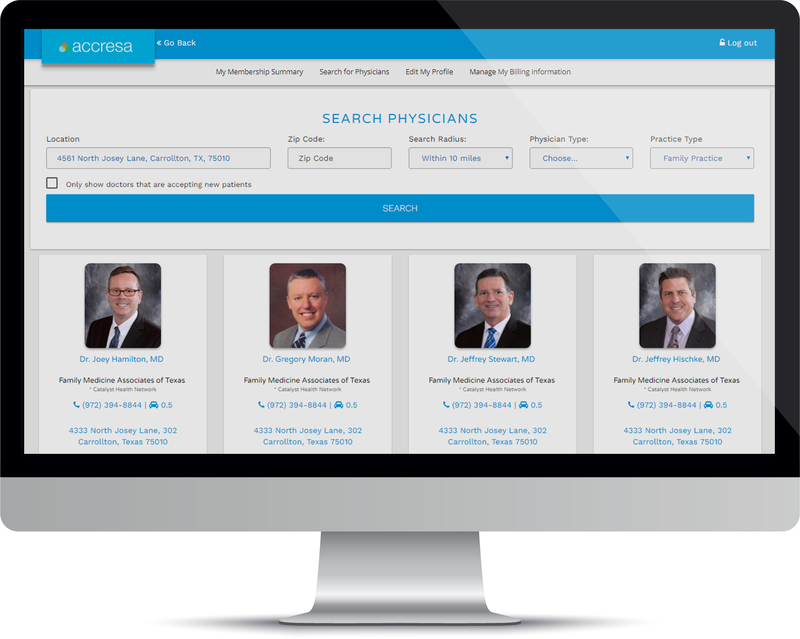 Log in to Accresa and click "Search for Physicians" at the top of the page. Love your primary care physician and want to introduce them to the benefits of Accresa? Tell them to check us out at accresa.com and reach out to us for information on how to join.